Ok, not so much. Carving a lot of paddles is tough work. It uses aggressive power tools that requires a lot of attention, makes a lot of dust, and you have to do this for hours on end. So, I need to space this demanding work out some. This week I did that by Making a new guitar neck. I made the mold over the winter, I prepared the sides while I was preparing stock for the SE117s, and I had the soundboard and the back prepared a couple of years ago. So, if it looks like this one gets built fast, remember that it's just an illusion! This one is special. 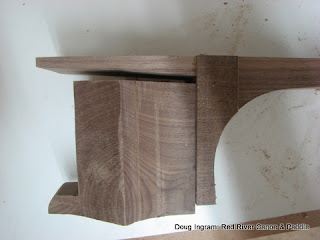 I am making a new classical guitar, but this one will have a double cutaway much like a Gibson ES335. The body uses the Fleta plantilla. 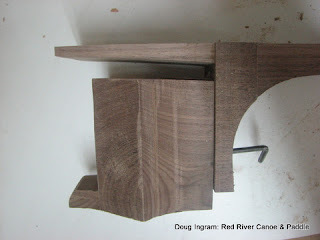 I have got it in my mind that I should do an elevated fingerboard, too, and that the action should be adjustable. That's a lot of challenges all at once! 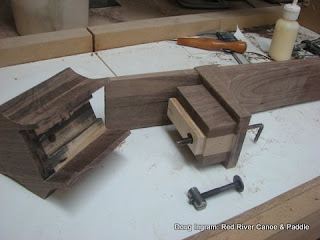 What makes this neck challenging is how to make the elevated fingerboard and the adjustable action. 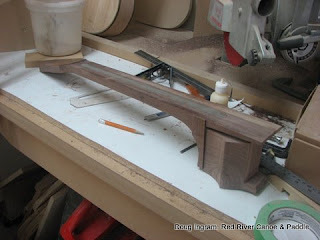 I could have done it by having an adjustable neck angle as famously done by Stauffer, but on this one I decided to work out a way for the whole neck to raise and lower. Above you can see it in the lowest position, which means that the strings will be highest. Below you can see it in the highest position, which will mean that the strings will be lowest. Possibly overkill, but I have about 4-5mm travel. The wood work conceals some of the hardware. The joint is basically a sliding mortise and tenon joint. There is a large headed Allan key screw/bolt in the heel of the neck, and an anchor in the neck block, just like the one in the foreground. Posted by Doug Ingram at 10:18 p.m.